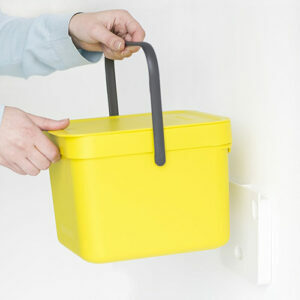 Looking for yellow kitchen accessories to add the finishing touch to your kitchen design? 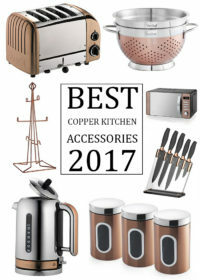 We’ve looked in depth at the very best products on the market to bring you a list of the most stylish, robust and value for money products that are of the top most quality. 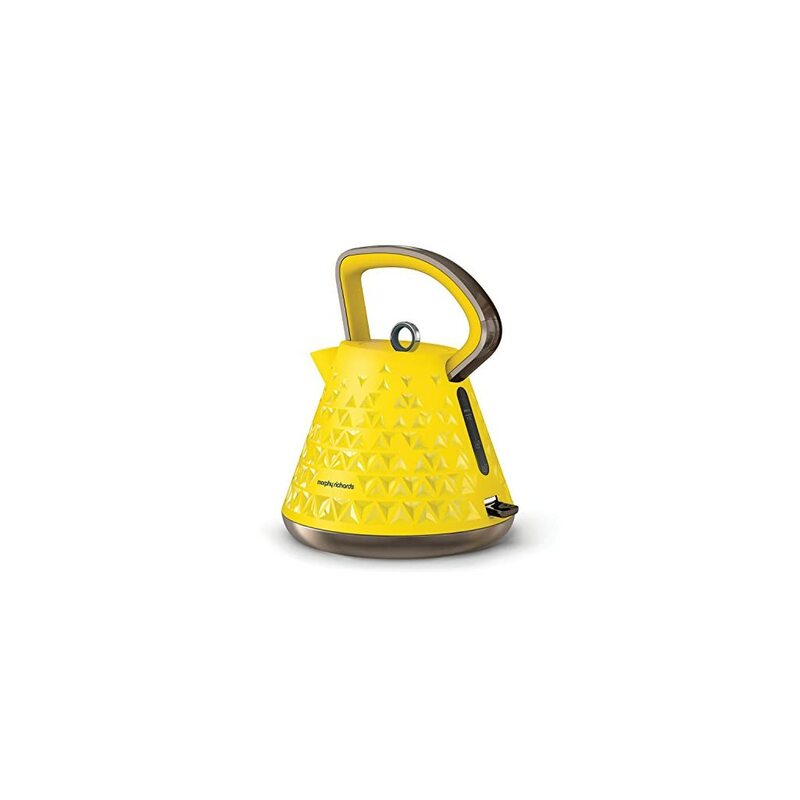 Kicking off our list of 2017’s best yellow kitchen accessories is the splendidly designed Prism Kettle by Morphy Richards. With its seriously eye catching design, huge 3kW of power and reasonable pricing this kettle is a serious contender when it comes to choosing the best kettle on the market. What makes this kettle so stylish is its unique prism pattern, gloss and matt dual texture finish, and brushed chrome handle and base. Once you get over it’s great looks you’ll come to appreciate it’s concealed element featuring 3kW of power for a rapid boil. The kettle also features a large 1.5L capacity to make up to 6 drinks at a time and an easy view water window so you’ll only boil the exact amount you need. The kettle ensures a quality hot drink, free of limescale as it’s removable limescale filter is easy to remove for a quick wash whenever needed. Plus keep your worksurfaces clutter free with the kettle’s cord storage built into the base. You’ll only ever need to see the amount of cord needed for practical use. The kettle itself is cordless and can be replaced on it’s 360 degree base at any angle, making it perfect for right and left handed users. The base is also a perfect fit to the bottom of the kettle, so much so that when the kettle is sat on top it looks like a permanent fixture. Though this features doesn’t offer any extra functionality it does so very beautifully add to the kettle’s streamlined design. Overall if you’re looking for a kettle with good looks as well as top functionality then the Morphy Richards Prism Kettle is a real winner in our eyes. The attention to detail that Morphy Richards have bestowed on this stunning kettle is worth getting excited about – even if it is just a kettle. 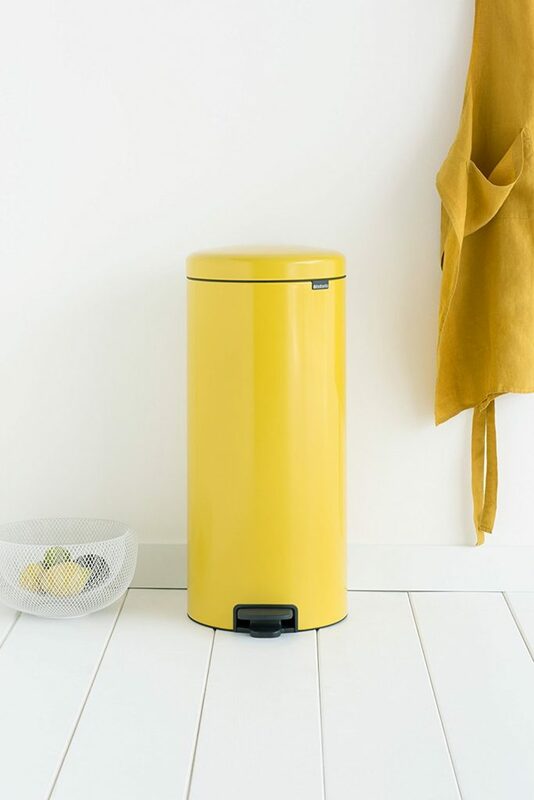 You’d think there wasn’t much to get excited about when it comes to choosing your kitchen bin but we absolutely love Brabantia’s range of newIcon Pedal Bins that come in an impressive array of sizes and colours. Don’t need the family sized 30l bin? Don’t worry, Brabantia have it covered with 20l, 12l, 5l and 3l sizes. There are many reasons why these bins are so special. To begin with the silent action foot pedal will keep your hands germ free. 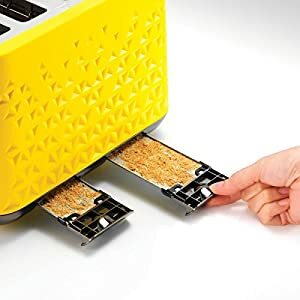 Perfect for when you’re in the middle of preparing food. Plus it’s soft-close lid ensures it closes whisper quiet every time. No irritating clanking as the lid closes shut! 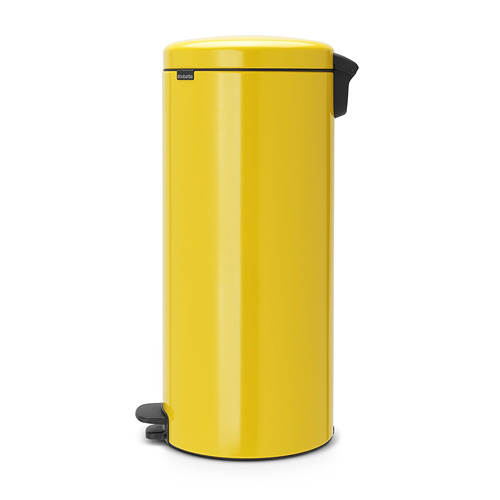 Brabantia have a habit of creating the best looking bins around. They know good design and the sleek style and finish of the newIcon range will mean any owner of this bin will be happy for it to stand out rather than be kept hidden away. When we think of bins we usually think of bad odours. Not so with the newIcon! This bin will keep your kitchen smelling fresh as it’s odour proof closure will keep those nasties locked away. Despite being at the upper end of the market this range of bins are still excellent value for money. Most metal bins suffer from corrosion and don’t always stand the test of time but you can rest assured that Brabantia have conquered this. Using durable corrosion resistant materials they have made a bin to last. On top of this every bin comes with a 10 year guarantee! 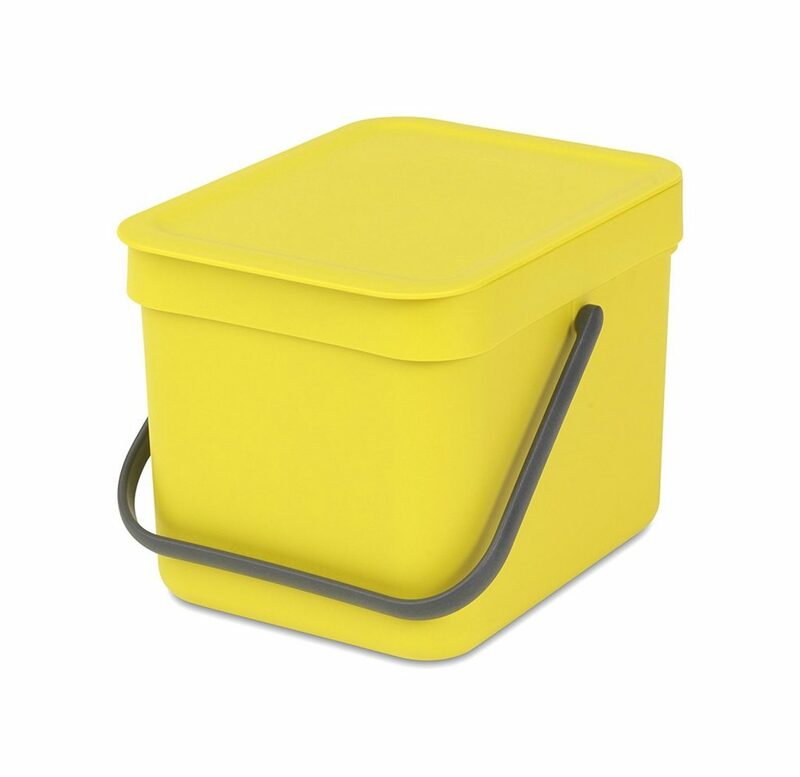 The newIcon bin also comes with a sturdy carry handle for ease of use and a protective non-slip floor ring to protect your floors and keep your bin in place. 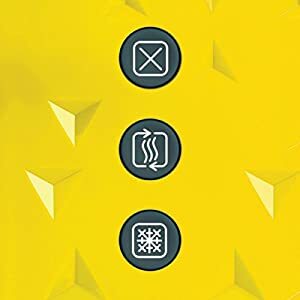 The strong removable inner bucket makes the bin easy to clean and with each bin you’ll receive a sample pack of matching size PerfectFit bin liners that create a snug fit with no unsightly overlap. And finally, but not least, the newIcon bin is the sustainable choice when it comes to choosing a new bin. With each purchase of a newIcon bin you’ll be supporting ‘The Ocean Cleanup’ campaign. Each bin is manufactured from 40 per cent high-grade recycled materials. For every bin sold Brabantia will make a donation to ‘The Ocean Cleanup’ campaign to help fulfil the mission of ridding the world’s oceans of plastic. If you’re looking for sustainability, excellent quality, stylish good looks and all the best features then give top consideration to the newIcon by Brabantia. 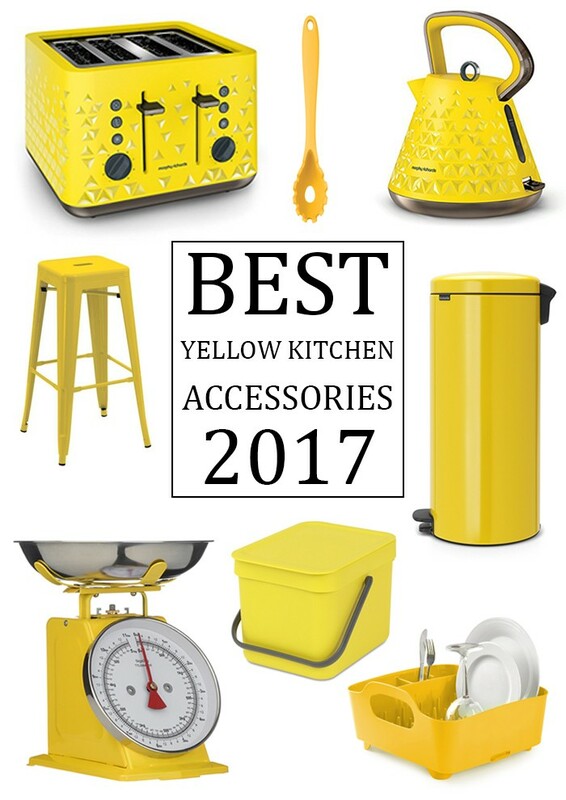 These are truly yellow kitchen accessories worthy of purchase. To add an inexpensive splash of yellow to the kitchen consider this all-in-one, self-draining dish drying rack made by Umbra. 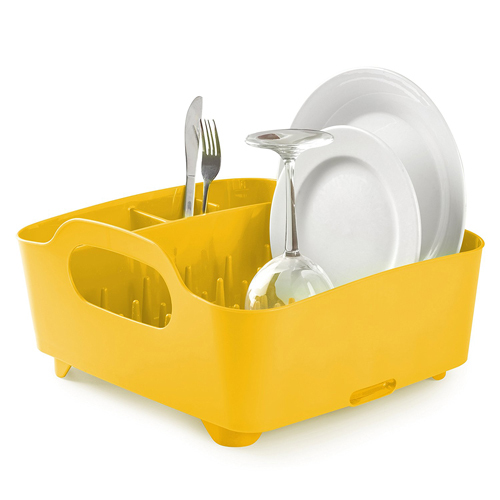 Perfect for smaller kitchens (but able to dry lots of items) this cute yellow rack will collect and divert water back into the sink without the need for a messy drip tray. The drainer is designed to hold an array of different sized items and it’s tall sides will ensure nothing falls out. Made from a high quality durable BPA-free plastic with a matt finish the Umbra dish rack is made to last. It will also ensure no contamination from BPA once your dishes are spick and span. Cleaning it is a doddle if you just pop it in the dishwasher every now and again. 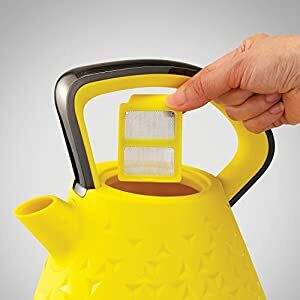 We couldn’t include the Prism kettle in our yellow kitchen accessories list without including the matching Prism toaster. And to be honest this range of small kitchen appliances is one of the market leaders and you’d struggle to find a better yellow toaster. Everything that makes the Prism kettle so stunning and stylish of course goes for the Prism toaster as well. 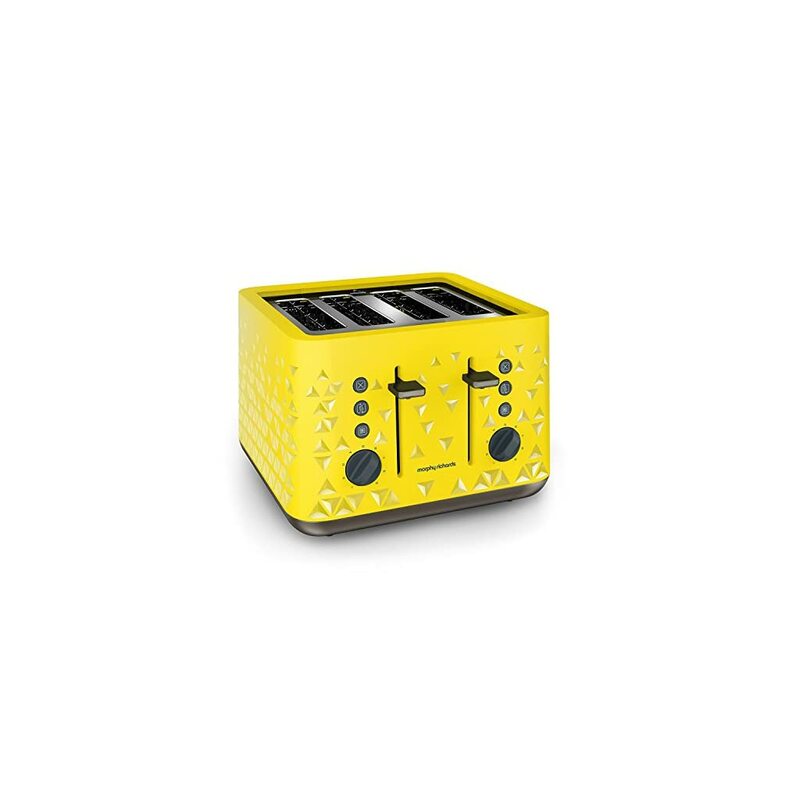 Again you’ll find the body of the toaster includes a gloss and matt dual texture finish and the impressive prism pattern, all in a vibrant yellow that will immediately brighten and jazz up any kitchen. And it’s got all the functionality you could need for making perfect rounds of toast. 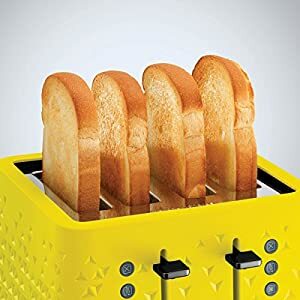 With the toaster’s deep variable width slots it’ll evenly toast bread whether you like it thick or thin and with it’s variable browning control you’ll achieve perfect toast, just the way you like it, every time. Once the toast is ready the toaster features a nifty auto high lift to help you easily remove your toast without burning your fingers. It also has illuminated buttons to help you easily identify the cancel, reheat and frozen functions and with it’s removable crumb tray it’s easy to keep this toaster clean and tidy. Just like the kettle this toaster has handy cord storage meaning your toaster will sit neat and tidy on your worktop. No need for excess cord getting in the way. Once you own one of these kitchen appliances you’re probably going to want the other – and we can’t blame you! 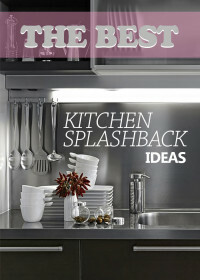 They will make the ultimate statement piece in any kitchen. There’s a reason Brabantia are featuring twice in this list. They make just darn good bins! 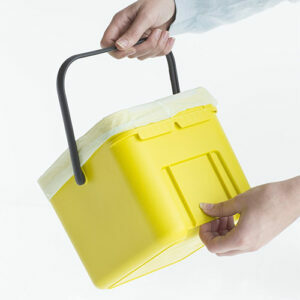 And this handy little 6l caddy will look great on your worktop, can be fixed to the wall or can easily slip inside a deep kitchen drawer because of its compact size. Need it a little bigger? It comes in 12l and 16l sizes too. For lining the caddy perfect fit 100 percent Compostable bags are available by Brabantia for all Sort and Go Food Waste Caddies. The caddy comes equipped with a sturdy carrying handle to make lifting, carrying and emptying a breeze. Its flip up lid can be fixed in the open position making loading the bin, with compostable waste, a mess free task. Every size Sort and Go Caddy comes with a handy easy-fix wall bracket which means it’s easy to hang on the wall if that’s what you’d prefer. As is always expected from Brabantia this caddy is of strong construction to cope with a demanding kitchen. It is built to last and will manage all your organic waste needs for years to come whilst bringing a little vibrant colour and attractive design to the home. 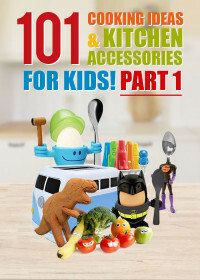 Kitchen Craft have created, in a multitude of colours, these wonderful kitchen utensils. Each piece is available to buy individually so you only need to buy the utensils you actually use. 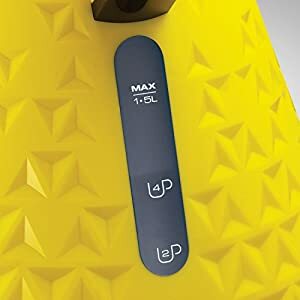 At the core of most of this range is strong, durable nylon that is coated in the highest quality LFGB-grade, food safe silicone. You’ll truly appreciate the benefits that this tough but flexible silicone offers. It’s anti-scratch so is the perfect material for using with non-stick pans. 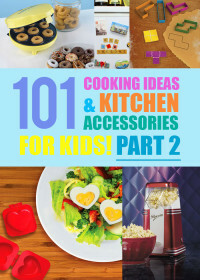 You won’t accidentally damage your saucepan as you’re stirring your sauces or scooping up eggs. Plus it’s also odour, stain and heat resistant to temperatures as high as 260 degrees Celsius (500 degrees Fahrenheit) so can definitely live up to every kitchen task. Silicones flexibility gives it the ultimate quality of bending and flexing to the curves of every bowl and pan, allowing you to scoop out every last drop. Soft and comfortable to hold it provides a non-slip grip for added safety. 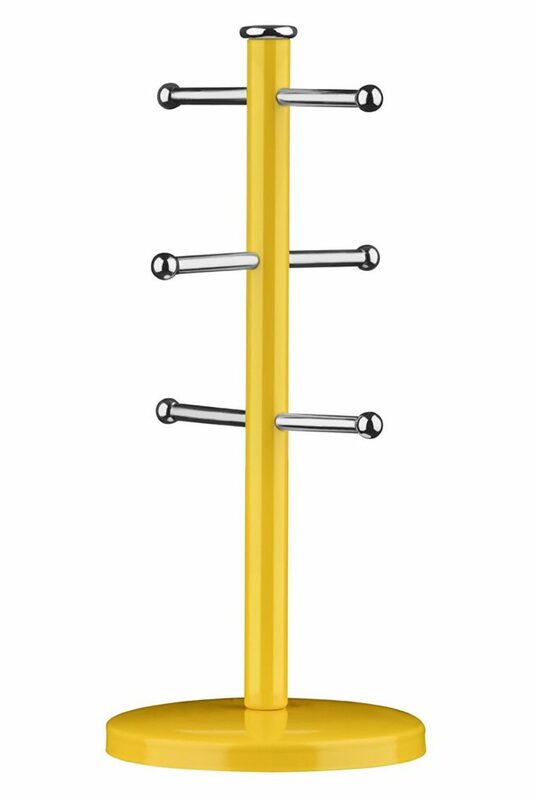 With an integrated hanging loop each utensil can either be stored in a drawer or provide a colourful display hung up on a utensils rack. These utensils will undoubtedly last a long time and come complete with a 5 year guarantee for peace of mind. 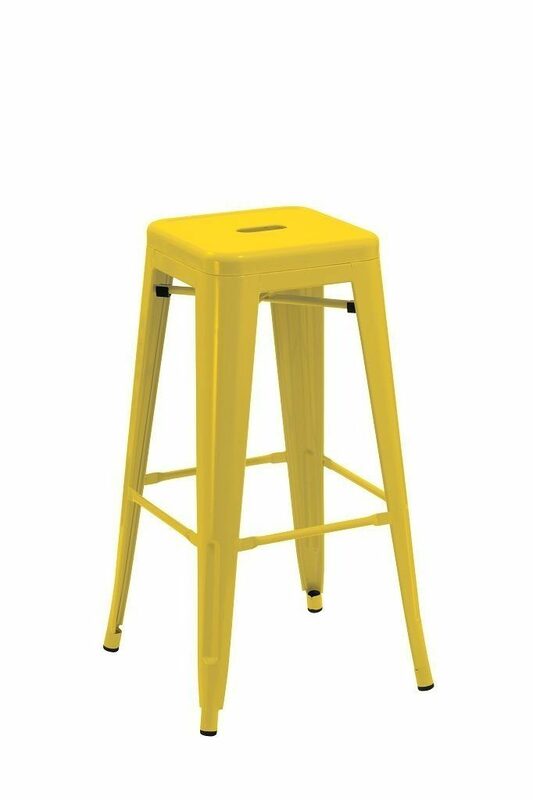 Having stumbled upon these brightly painted iron bar stools we couldn’t not include them in our list of yellow kitchen accessories. We think they look great and will bring a touch of industrial chic to your kitchen. Perfect for sitting at a breakfast bar with to enjoy some equally sunny eggs. These beauties will create a flash of colour even when stored away under the counter. They have rubber feet to prevent damage being done to your kitchen floor as well as keeping them stable. They’re also stackable should you require an alternative storage solution and can hold up to a maximum of 120 kg. This listing is for a set of two and will arrive fully assembled. Not enough storage space in your cupboards or just like having mugs close to hand for a quick coffee? Consider getting yourself one of these yellow mug trees to hold up to six of your favourite mugs. Made of sturdy and durable metal that’s easy to clean with a soft damp cloth, this item will make a great addition to your kitchen worktops. 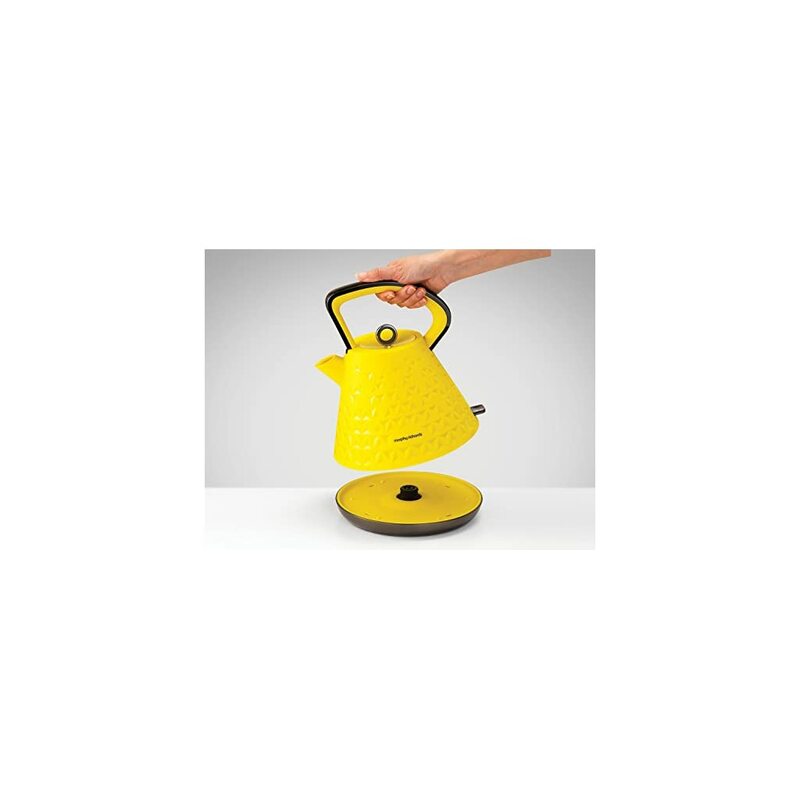 If you like the look of this item then maybe consider checking out all of Premier Housewares colour co-ordinated yellow kitchen accessories range that is equally durable and reasonably priced. 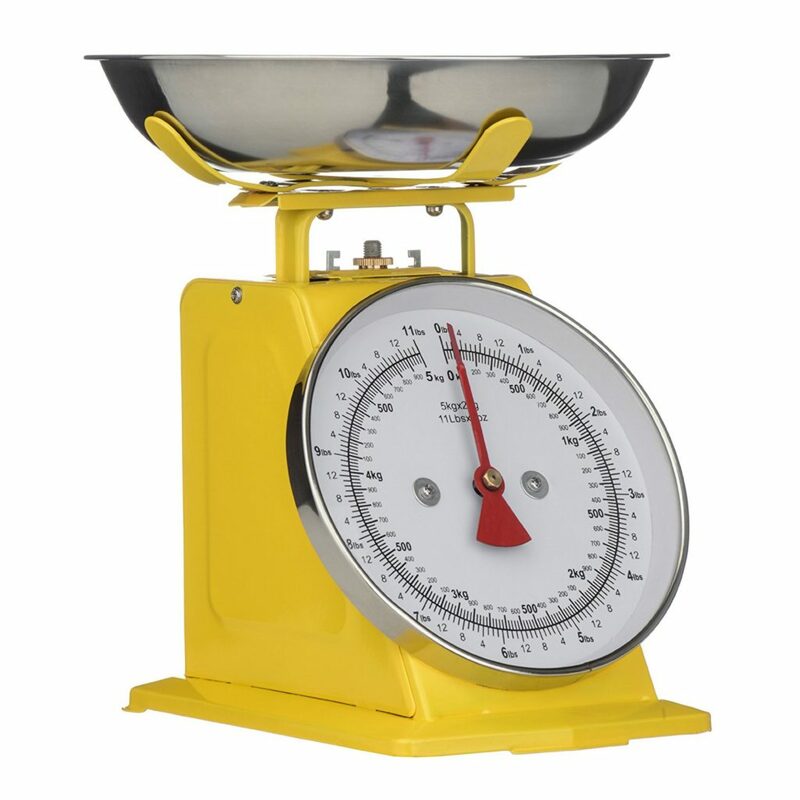 Following on from Premier Housewares mug holder is their fantastic looking retro kitchen scale. Have you got a bit of a vintage theme going on in your kitchen or are you after a statement piece to dress your counter with? 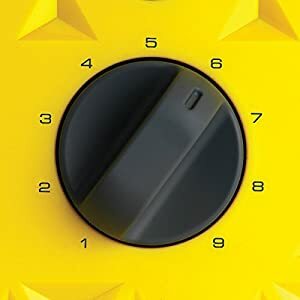 Adding this yellow scale will certainly make a great finishing touch whether your kitchen is modern or retro. This kitchen scale includes metric and imperial measurements on a clear and easy to read dial to give you an accurate reading. It’s large capacity stainless steel bowl will also easily hold all your ingredients. What more do you need? Artist, designer, web developer and mother of one.